Falkreath Hold is a hold in southern Skyrim, with its capital in Falkreath. It is initially affiliated with the Imperial Legion, but can be captured by the Stormcloaks after completing Rescue from Fort Neugrad. It can also change sides as part of negotiations during Season Unending. It is the second southernmost hold in Skyrim, after the Rift. 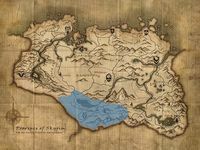 It borders Cyrodiil in the south, across the Jerall Mountains, and Hammerfell in the west. 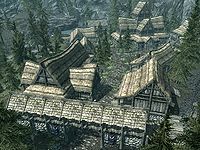 Other than its capital, Falkreath, the only notable town in the hold is Helgen, the first settlement in Skyrim to be attacked by a dragon. 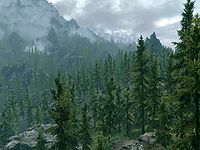 Falkreath Hold is blanketed by characteristic pine forests and described by its citizens as being covered in a fine mist that makes it seem seasonless. The mountains rising above Falkreath are well above the snow line striking a stark comparison to the green of the rest of the hold. The most distinguishing geographic feature is Lake Ilinalta which covers a large portion of the central region and acts as the source for the White River. The town has the largest cemetery in Skyrim that houses generations of the dead, due to a large number of battles that have taken place over the years. The citizens take pride in this and many of the local shops and the farm derive their names from their close proximity to so much death. The pine forest of Falkreath is very rich in thistles, mora tapinella, and all common varieties of mountain flowers. Lake Ilinalta is home to a large population of different fish species which can be found near the Lady Stone and by the start of the White River. The hold is one of the few places where nightshade is fairly common. In the snowy eastern parts only the snowberry bush thrives. All locations in Falkreath Hold with individual map markers are listed. There are a few places without map markers listed for their significance. There are three Dragon Mounds in Falkreath Hold. There are a few Shrines in Falkreath Hold. 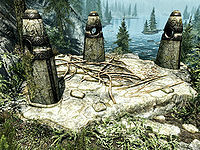 A Shrine of Talos south of The Guardian Stones. A Shrine of Akatosh northeast of Twilight Sepulcher. Two Shrines of Arkay outside Falkreath's Hall of the Dead. The Plague of the Dead Creation adds a ritual site north of Southfringe Sanctum. All the Dark Brotherhood primary quests except for Hail Sithis!, and most of the other quests received before Hail Sithis!, are related to Falkreath Hold. In addition, many miscellaneous quests are located in Falkreath Hold. They are listed here. This page was last modified on 14 April 2018, at 21:09.